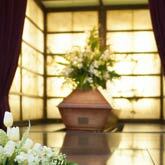 Cremation is the preferred choice for almost 70% of funerals today for a variety of reasons. If you are considering cremation, the main decision you need to make is to decide which crematorium to choose. You may choose whichever crematorium you wish, even if it is not the closest. It’s a decision which most families make based on personal preference or the location of a former family funeral. • Markeaton Crematorium – in the City of Derby. Bramcote has two chapels – the Serenity Chapel and the Reflection Chapel. The Serenity Chapel can seat up to 120 people and the Reflection Chapel can seat a maximum of 46 people, with no additional standing room. Bramcote offers the facility to show a photo presentation on screens at the front of both chapels, and also the option to record or webcast the Service. Mansfield has two chapels – the Thoresby Chapel and the Newstead Chapel. The Thoresby Chapel can seat up to 150 people and the Newstead Chapel can seat a maximum of 50 people, with no standing room. Amber Valley has one chapel which seats around 90 people. This crematorium offers the facility to show a photo presentation on screens at the front of the chapel, and also the option to webcast the Service by secure link. Wilford Hill has two chapels – the Main Chapel and the West Chapel. The Main Chapel can seat up to 80 people and the West Chapel can seat around 60 people. This crematorium offers the facility to show a photo presentation on screens at the front of both chapels, and also the option to record or webcast the Service. Markeaton has two chapels – the Main Chapel and the Round Chapel. The Main Chapel can seat up to 80 people and the Round Chapel can seat a maximum of around 35 people, with minimal standing room. This crematorium offers the facility to show a photo presentation on screens at the front of the chapel, and also the option to record the Service. Gedling Crematorium has one chapel, which seats around 90 people. This crematorium offers the facility to show a photo presentation on screens at the front of the chapel, and also the option to record or webcast the Service. For more information about the facilities of our different local crematoria please speak to your Funeral Arranger. All of the six crematoria have computer based music systems from which the music for the funeral service is played. With the exception of Markeaton Crematorium, an organ is also available in certain chapels at each crematorium, and if required we can arrange for an Organist to play at the funeral service. Some crematoria have facilities for the funeral service to be webcast, allowing family members who are not able to be present to watch the funeral. Some also have facilities to show a photo montage during the service. All chapels are accessible for wheelchair users. All of the above crematoria offer a 25 – 30 minute Chapel time. This is usually sufficient for a Service led by either a religious minister or an independent celebrant. However, if you would like a longer time for the Service, we can book two concurrent time-slots at the crematorium. Alternatively, some families choose for the funeral service to be held in a different venue, such as a local church. If so, the service at the crematorium would take the form of a short committal – either attended by close family only, or open to all who may wish to attend. Traditionally, this would take place after the funeral service in the church or chapel, although another option some families choose is for the family to attend the committal service first, and then hold a Service of Thanksgiving afterwards. 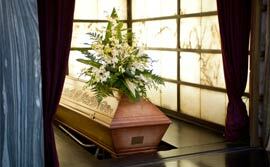 Some families choose to hold the funeral service and committal in church, with the coffin then being taken to the crematorium without the family present. After a cremation, cremated remains can be scattered in the crematorium grounds, or we can collect them from the crematorium, and either return them to the family for a private scattering, or arrange for a burial in a local churchyard or cemetery. Your Funeral Arranger will ask you what you would like to happen with the cremated remains. However, if you are not ready to make that decision, we can hold them at our premises until you have made your choice.